It’s hard to believe that Boomers considered “peace, love and understanding” a viable worldview vs. today, where the choices are far more bellicose. Often, we look to artists to help us focus, to organize our world and express it in a way we can understand, knowing that all artists, whatever their medium, incorporate their various life experiences into their work. 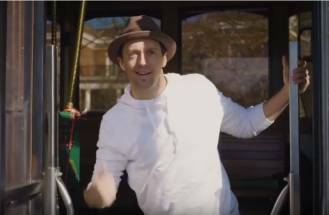 For singer, songwriter and activist Jason Mraz it was a visit with a Buddhist monk in Myanmar six years ago that gave birth to his new single “Have It All.” A Traditional! Pop! Song! with a big dose of happy. How can you not love lines like these? Could “be happy” be trending? For 5-minutes? Country’s Luke Bryan’s hopeful, upbeat message made “Most People Are Good” a hit, and Kenny Chesney’s anthemic “Get Along” is headed to #1.